We have two excellent choices when it comes to eating and drinking out close to the glamping site in Longtown. The Crown Inn built in 1751 is located very close by and is either a short walk or drive away. The Crown have a good selection of food and drinks and are located at the heart of the village. Food is served everyday apart from Wednesday lunchtimes. The Bridge Inn is also not far away. Recently refurbished the Bridge Inn have a fantastic selection of great food and traditional ales. Slightly further away in Ewyas Harold there is also the Temple Bar Inn and the Dog which also offer food and drinks. Hay on Wye lies on the east bank of the River Wye and is within the Brecon Beacons National Park, just north of the Black Mountains. Hay has approximately 1,900 inhabitants. The village of Cusop lies on the other side of the Dulas Brook and is in England. The nearest city is Hereford, county town of Herefordshire, some 22 miles (35 km) to the east. The town was formerly served by Hay-on-Wye railway station by the train services known as the Canney Creeper, which closed in 1963 under the infamous Beeching Axe. Abergavenny is promoted as the "Gateway to Wales" and as such is a picturesque market town just a twenty minute drive from the glamping site. Here you will find local traditional shops, cafes and restaurants together with weekly markets to explore. Abergavenny is also the closest railway station to our glamping site if you are looking to arrive by train. The Black Mountains are a group of hills spread across parts of Powys and Monmouthshire in southeast Wales, and extending across the national border into Herefordshire, England. The Black Mountains may be roughly defined as those hills contained within a triangle defined by the towns of Abergavenny in the southeast, Hay-on-Wye in the north and the village of Llangors in the west. Another 'gateway' town to the Black Mountains is Talgarth. Hereford Cathedral, located at Hereford in England, dates from 1079. Its most famous treasure is Mappa Mundi, a mediaeval map of the world dating from the 13th century. The cathedral is a Grade I listed building. A Cathedral dedicated to the martyred King Ethelbert has stood on this site since Saxon times and is home to a community which has worshiped and worked together here continuously for well over 1200 years. Ewyas Harold is a small friendly village about 6 miles away from the glamping site, with the drive between the two locations being quite spectacular. Situated on the Dulas river at the southern end of the Golden Valley, Ewyas Harold is a thriving modern village with a primary school, post office and variety of village shops and businesses. 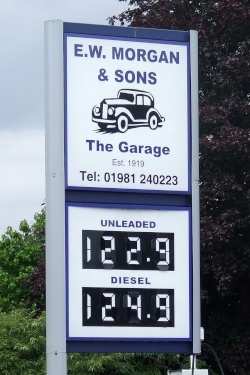 Ewyas Harold also has one of the oldest working Petrol Stations remaining in the area (E W Morgan & Sons) which has been in business fuel since 1919. The term black and white village refers to several old English villages, typically in the county of Herefordshire, West Midlands of England. The term "black and white" derives from presence of many timbered and half-timbered houses in the area, some dating from medieval times. The buildings' black oak beams are exposed on the outside, with white painted walls between. Visit Hereford’s famous Cider Museum and learn about the history of cider making. How the apples were milled and pressed and how the resulting juice was fermented to produce cider. Set in a former cider making factory, visitors can explore original cider champagne cellars and view cider making equipment, a cooper’s workshop and a vat house. Longtown Outdoor Education Centre is a fully equipped residential centre for up to 55 people which includes a new disabled access facility. Excellent on-site facilities set in 15 acres of private grounds on the eastern edge of the Black Mountains and the River Monnow. Facilities include a canoe training pool, an abseil tower, a zip wire, a ropes course, climbing walls, navigation courses and problem solving exercises. The Brecon Beacons, the Wye Valley, the Forest of Dean and the Gower are all within easy reach. Activities include Caving, Gorge Scrambling, Mountain Walking, Canoeing and Coasteering.